Is that 599hp from the stage 2, RWHP or crank hp? Also what is the stage 1 RWHP or crank hp? Both systems are close to the same RWHP the stage 2 putting down about 550RWHP the stage 1 just a little less. The Stage 2 is slightly underdriven giving it a little more power and uses an Edelbrock wider pulley system. The stage 1 uses stock pulley system and is not underdriven. Then why is the advertisement saying 599HP? I am about 48 hours from buying an EForce system and don't really know which one to get. The stage 2 is supposed to be 2 psi more - 6 psi versus 8 psi. You would think that 2 psi would net you more than 13 HP over the stage one 537 HP. Advertising unless stated will normally use Flywheel HP ratings which is higher than Rear Wheel HP (RWHP). All HP ratings are subjective given the conditions in which the test was run, they are a guideline. I don't mean to be adamant, but Edelbrock says their stage one system has 624 flywheel HP and that their stage two system has 537 RWHP. 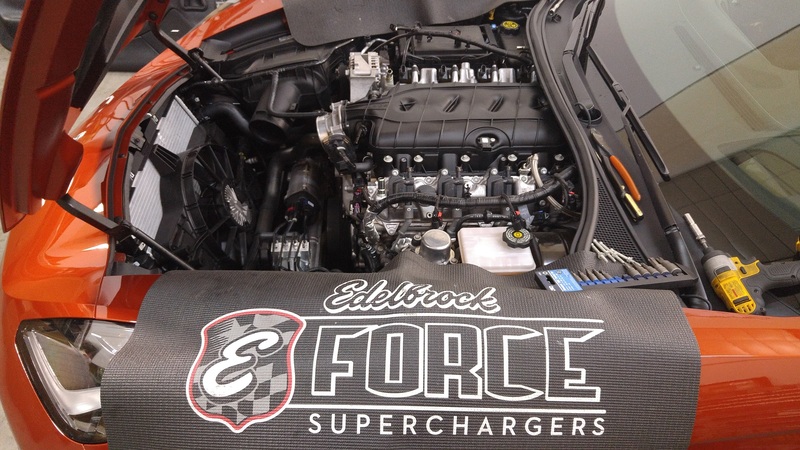 So far, nobody including Edelbrock can answer what the true rwhp or crank hp of the stage 2 system is. 624 flywheel HP loosely translates to 537 RWHP. Yet, the stage 2 system has 2 more PSI! Does anyone here understand the point I am trying to make? Do I just go out and buy the stage two system and hope for the best? The guy at the technical line at Edelbrock really didn't know what he was talking about - I had to correct him several times and both times he admitted his info was incorrect. Yet, he told me that the stage 2 system also has the supplemental warrantee. Is this correct? Please don't take this wrong but I think your fixating on a number that varies greatly from dyno to dyno, area of the country, to time of year the test is run. 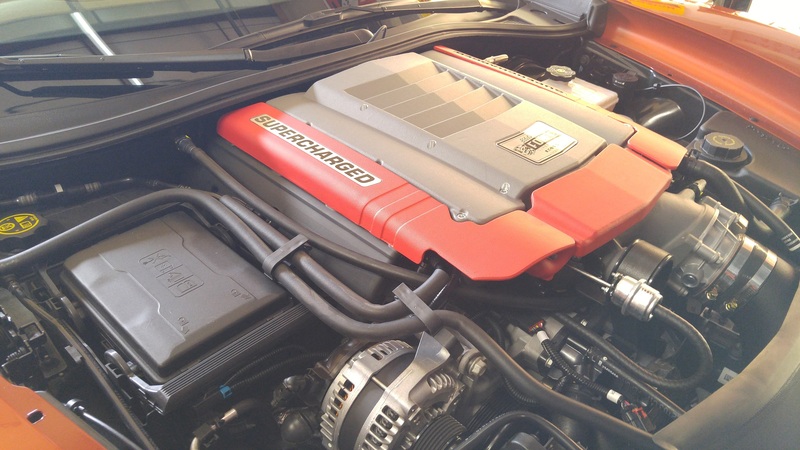 What I can tell you is the major difference between the (2) units is the Stage 2 uses a 3.25" supercharger pulley and the Stage 1 is a 3.50" pulley so in the Stage 2 you get a little ( little is the operative word) more horsepower, boost comes in a little quicker because the supercharger is spinning faster. I can also tell you all the units we have installed have all been Stage 2 and when we've dyno the car after install we have seen 545-575 rwhp depending on conditions on a dynojet dyno here in Central FL. I can also say with the stock tires on the car you will have a very hard time hooking the car up and so far everyone of our customers have left with a VERY BIG SMILE ON THEIR FACE. 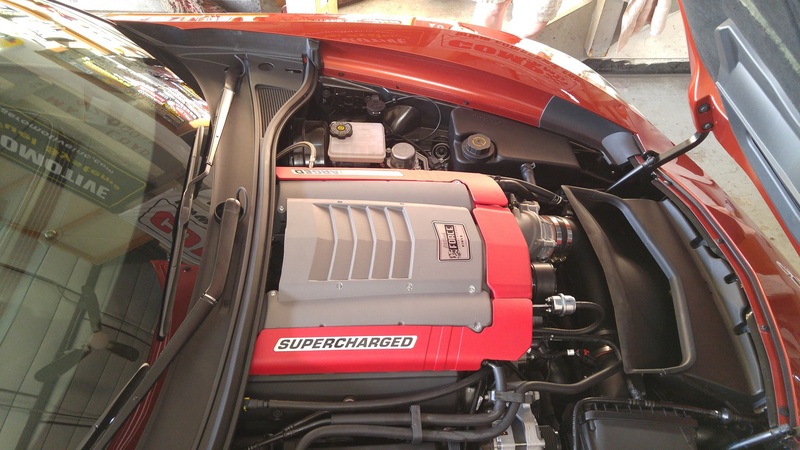 Let me also say that all Stage 1 and 2 E-Force Superchargers come with a 3yr. 36,000 mile warranty. Now if you have 2000 miles on the car the warranty is still only to 36,000 miles and if you have 35,999 its only good to 36,000 miles. The price difference between the 2 units is $82.00 the difference in the cost of the pulley my quess. Thank You! This is the most information anyone has ever provided regarding the two systems and your reply makes perfect sense. Best case, if the stage two makes 670 RWHP, taking off 14% with an M7, gives us about 575 RWHP. I get some wheel hop now, does that go away with more power, or do I just break half shafts? Let me start by saying if you are at 5000ft ASL you most certainly want the Stage 2 kit. With the air so thin you'll want to spin the SC faster. From your comment about wheel hop I am guessing you do straight line stuff. With the added power your going to want to learn how to roll out of the box before hammering the throttle down to stop the wheel hop also at the strip disconnect the front sway bar to get weight transfer to the rear wheels will help with wheel hop. Our road race guys haven't experienced that and haven' broke any half shafts. Look forward to working with you. Call us toll free we'll take care of you.